Looking for the best Fishing trails around Fort Morgan? Find the top rated fishing trails in Fort Morgan, whether you're looking for an easy short fishing trail or a long fishing trail, you'll find what you're looking for. Click on a fishing trail below to find trail descriptions, trail maps, photos, and reviews. That was fun. And yes it's not an aggressive trail, mostly flat but the length was perfect. Of course I never plan my water right but once I hit the end in Greeley (I started in Windsor) I rode into to town and fueled up on water. I went today 7/8/17, a bit warm but I didn't want to stop and double back because each part of the trail was so interesting, I wanted to see what each curve brought, even the few miles through "town" looking at the houses up against one of the many small lakes was interesting, Kinda want to live there now. Thanks Larimier County and or Weld and Traillink. This is an easy 21 mile paved and mostly flat trail that goes to/from Greeley to/from Windsor with plenty of stops in between. A portion of this trail is within the city but the majority is out in the country and you are surrounded by beautiful views of mountains, open fields, lakes, trees and farmland and all that you can hear is the wind rustling through the trees and maybe a small critter jumping into the water. I would say the best time to go is in the spring or fall when the air is cool and crisp, or in the early morning hours of the summer. Rented bikes in Windsor, Rode west to the trail end. Rode back east beautiful scenery the whole way. 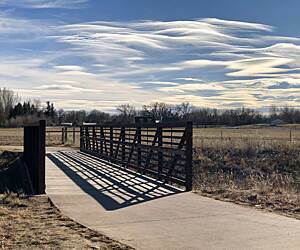 Had hopes of riding to Greeley but recent rain and high river levels had the trail closed. Would definitely return with hopes of continuing this ride. A great trail that connects you to 4 other long trails, A MUST DO! What a great place to ride and visit!! Recommend Fort Collins as a play to have a great time. Stayed at the Armstrong Hotel right on S. College and Olive. Great food, jazz, crowds of folks. Poudre Trail was under construction 'a bit', but this trail is still a good ride, and connects you to the Spring Creek, Fossil, Power, and Mason trails. We road the entire circuit on our hybrid bikes. Couldn't ask for better times!!! As always, recommend you visit local government web sites / trail sites to get latest trail status, etc. These trails take you through country side as well as near apartments, stores, etc...BUT IS ALMOST ENTIRELY bike/pedestrian only access. WE LOVED IT! Plan to do this again...because Fort Collins is a place that adults can have fun at night, bike during day. I love riding this trail round-trip from Windsor to Greeley & back. Have ridden in it in all seasons on my road bike - so much wild life to see, beautiful scenery, and never crowded. The only caution is you need not just one but a few spare tubes in the fall...one day my husband & I had 3 flats on 2 bikes within 15 minutes! 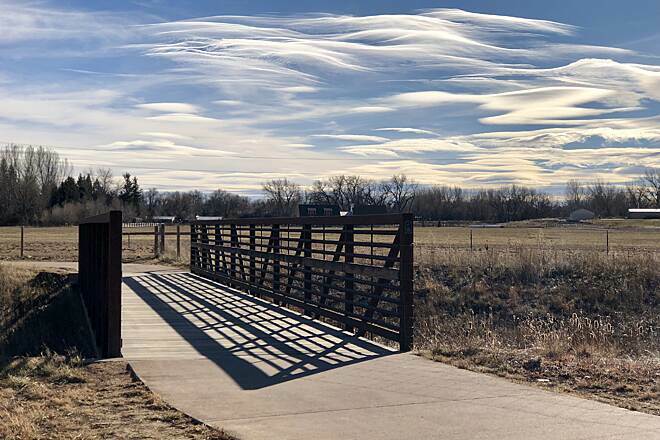 My wife and I rode our recumbent trikes on the Poudre River Trail from end to end and found it to be a very pleasant ride. From the smooth surface, nice scenery, and the great weather today it made for a great day on the trikes. This trail is made for the family outing. The trail is wide, smooth, and flat. Just made for the beginner to intermediate rider. There are lots of interpretive signs along the route to explain the history and ecology of the area. This year we started at the Poudre Learning Center, about halfway on the trail, and headed east to Greeley. The eastern half is pretty wide open, and passes by many lakes from quarry operations. It is mostly flat and scenic. Good parking at the learning center and at the eastern end in Greeley. Along the way we saw cows, prairie dogs and white pelicans. This is my favorite trail in Fort Collins. You're out in the open, riding under tall, shady trees, and there are a lot of nice places to stop and take in the scenery. Additionally this trail is well-marked. A great 20mi trail from Greeley to west of Windsor. A new section just opened up in 2010 extending trail even further west, to eventually connect to Ft Collins. Flat, wide paved trail. Good place to park is Eastman Park off County Rd 17. Plenty of scenery along the way.